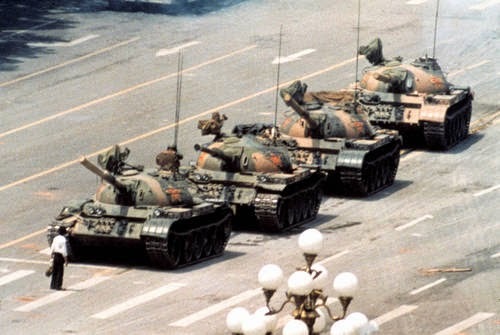 Today, much of the world will pause to remember the Tiananmen Square massacre. 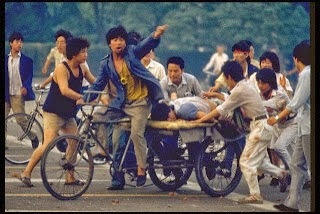 It occurred 29 years ago June 4, 1989, in China, in the world’s largest square. It was among the more horrific and heartrending stories I covered during my career as a Chicago Tribune foreign correspondent. As the world focuses on the upcoming meeting between the U.S. and North Korea next Monday, what happened that night in Tiananmen Square seems incomprehensible. Even though China helped broker this historic meeting, just like the China of 1989, the China of 2018 remains a nation of one-party rule replete with human rights violations and corruption. 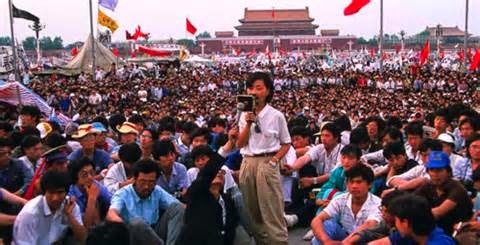 I wonder if the result would be the same if hundreds of thousands of students and other protestors were to occupy Tiananmen Square today. I hope we never have to find out. The post that follows contains my recollections of that gruesome night in 1989—one that is indelibly etched into my memory. It’s a little longer than most of my posts, but that bloody night in Tiananmen Square was also one of the longest I ever spent. I hope you will read on. At the end of my post you can click on the link to an interview I did with National Public Radio for the 25th anniversary of the massacre. 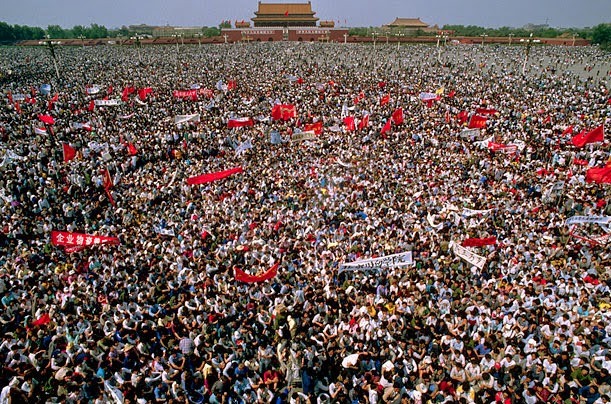 China was the world’s biggest story in the summer of 1989 when several hundred thousand students, labor leaders, and other dissidents occupied the 5 million square foot concrete piazza known as Tiananmen Square in the heart of Beijing. For seven weeks as the world watched, some 500,000 “pro-democracy” demonstrators descended on Beijing’s most sacred site to protest corruption, human rights violations and one-party rule. Today all evidence of that bloody night has been obliterated. Tiananmen Square is scrubbed and shimmering as it awaits the hundreds of thousands of summer visitors who will wander past the colossal portrait of Mao Zedong that hangs above the Forbidden City’s Gate of Heavenly Peace on the north end of the plaza and through the mausoleum that displays his waxy remains on the south end. China today is relatively sanguine and confident. Profits, not protests are the driving force among most Chinese. However, that was not the case in 1989 when Tiananmen Square was turned into a squalid, fetid tent city of protestors. For many young Chinese, the tragedy that unfolded in Tiananmen Square 29 years ago is ancient history—an event that has been glossed over, covered up and generally purged from the national consciousness by a nation eager to put forth its most dazzling and alluring face for tourists and the international business community. But on June 3, 1989, as I walked through what is generally regarded as the planet’s largest city square, the world was just a few hours from seeing China at its most ruthless and ugliest. The square that day was a hot, grubby place, strewn with refuse, canvass tents, and other makeshift dwellings. Under the towering “Heroes of the Nation” obelisk demonstrators cooked rice and soup while others linked arms and sang a spirited rendition of the “Internationale,” the world socialist anthem. Thousands of others dozed under flimsy lean-tos or blasted music from boom boxes. Near the middle of the square, the 30-foot tall “Goddess of Democracy,” a pasty white statue constructed by art students and made of styrofoam and paper-mâché, stared defiantly at Mao’s giant portrait—almost mocking the founder of modern-day China. A truck swept by periodically spraying billowing clouds of insecticide and disinfectant over everything and everybody in its path. Hawkers guiding pushcarts containing ice cream, soft drinks, rice cakes, candy, and film encircled the students doing a brisk business. Even if the students in the square had not been able to topple China’s ruling hierarchy, at least there were profits to be made. By June 3 the number of students occupying the square had dwindled to about 20,000 as thousands had already packed up and headed back to their provinces. But some students I talked with that afternoon were not ready to leave, and a few shared an intense sense of foreboding. One of those was Chai Ling. Chai, who had been elected “chief commander” by the dissidents, was the only woman among the seven student leaders of the pro-democracy protests. As we sat cross-legged on the hot pavement, she talked about the protests and just what the students had accomplished during their 7-week-long occupation of Tiananmen. Chai, the object of a year-long nationwide search by the Chinese government after the violence in the square, would eventually escape China to Hong Kong sealed for five days and nights in a wooden crate deep in the hold of a rickety ship. She managed to elude capture in China by adopting a series of disguises, by learning local Chinese dialects and by working variously as a rice farmer, laborer, and maid. Eventually, she would come to the United States, be nominated for the Nobel Peace Prize and graduate from the Harvard Business School. Barely eight hours after my conversation with Chai her warning would become a reality. Late in the evening of June 3 and during the early morning hours of June 4 the lethargy of weary demonstrators and the cacophony of boom box music would be replaced by shrieks of terror, gunfire and the guttural roar of tank and armored personnel carrier engines as the People’s Liberation Army rolled into the square, crushing tents and firing indiscriminately at protesters and anybody else who got in their way. A couple of hours before the violence erupted a few of us foreign correspondents had enjoyed a quiet meal together in the venerable Beijing Hotel on Chang’an Avenue a few blocks from the square. While dining we discussed the events of the night before when several thousand young unarmed military recruits were sent marching toward the students in Tiananmen Square. 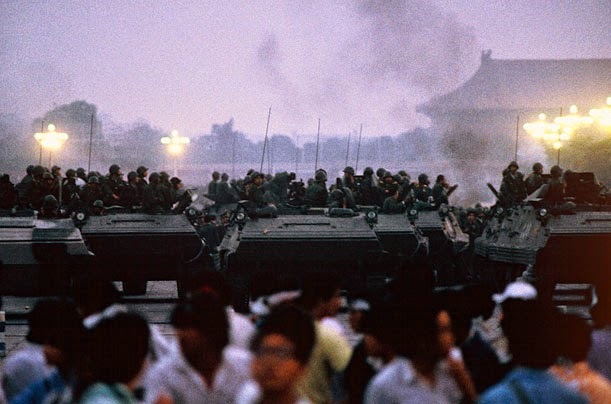 Before they got very far, an estimated 100,000 Chinese civilians poured from their homes near the square and confronted the soldiers—berating them for even thinking of entering Tiananmen to clear it of the thousands of students who had occupied it since late April. This rather benign event was nothing more than a probe to determine what kind of resistance armed troops might face when they stormed the square. For several weeks some 200,000 Chinese troops—most from provinces far away from Beijing—had been massing on the outskirts of the city. As Beijing entered its 15th day of martial law, it was also obvious that the government was still unable to enforce that decree. The government did admonish members of the foreign media to “observe regulations on news coverage” as they relate to martial law. “Foreign journalists must not talk with student protesters, and any news coverage of any kind in Beijing must receive prior approval,” said a statement by Ding Weijun, spokesman for the city. The statement also warned the hundreds of foreign reporters still in Beijing against inviting Chinese citizens to their offices, homes or hotels to conduct “interviews regarding prohibited activities.” Several foreign reporters had been expelled from the country for violating those rules. Many of us ignored those edicts and talked to anybody who wanted to speak anywhere that was deemed away from the prying eyes and ears of government authorities. 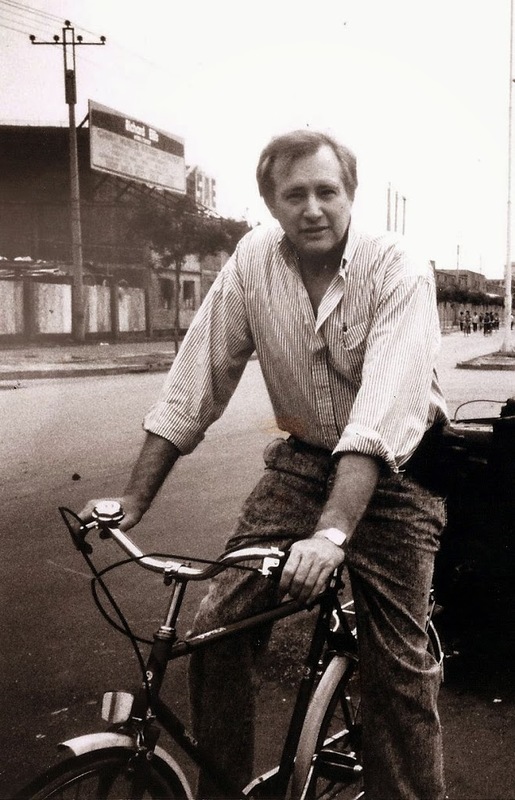 I also ignored the curfew, often riding my red and white Sprick bicycle down dark streets from my hotel to the Tribune’s offices that were located in a foreign housing compound a half-mile away. I got to know most of the Chinese police who were supposed to enforce the curfew. They would smile and wave as I peddled past. The morning of June 3, once again ignoring marital law rules, I took the Tribune car and my nervous Chinese driver, and we drove outside of the square and into several neighborhoods where streets leading toward Tiananmen had been shut down by angry civilians intent on keeping the Chinese Army from reaching the students. Dozens of intersections were blocked with buses, trucks, and makeshift barricades. Neighborhood leaders proudly showed me their arsenal of weapons—rows of gasoline-filled bottles complete with cloth wicks, piles of rocks and bricks, shovels, rakes, picks and other garden tools. “We will protect the students,” a man named Liang Hong, told me. Several days after the attack on the square when the authorities allowed people to travel once again in the city, I drove back to this same neighborhood. True to their word, I was told that Liang Hong and several of his neighbors had died or were wounded attempting to keep the army from entering the square. After dinner in the Beijing Hotel, I decided to take one more stroll through the square. As I rode into the square on the bicycle I had purchased after my arrival in Beijing from Tokyo two weeks before, I could see that many of the students were obviously spooked—not only by the unarmed incursion of the night before but by the intelligence pouring in from the neighborhoods surrounding the square that the army was on the move. I stopped at the foot of the Goddess of Democracy. The statue was illuminated by a couple of small spotlights as it looked toward the Forbidden City and Mao’s portrait. On the edge of the square, I bought a bottle of Coca-Cola then pushed my bicycle toward the four-story KFC restaurant on the south end of the square. It was about 8:30 p.m. and the restaurant (the largest KFC store in the world) was almost empty. I then rode the 2 miles down Jianguomenwei Avenue to the Jianguo Hotel where I was staying. I needed to file a story on the day’s events—specifically my conversation with Chai Ling and the other students that afternoon. I finished writing my story around 10 p.m. and decided, despite the curfew, to ride my bicycle back to the square for one more look around. I parked my bike on Xuanwumen Dong Avenue near the hulking Museum of History and Revolution on the east side of the square and began walking toward the “Heroes of the Nation” obelisk which had become the headquarters for the students. I hadn’t gotten very far when the sound of gunfire erupted. The firing seemed everywhere, amplified by the massive buildings that surrounded the square. I ran toward my bicycle, not wanting to be trapped in the square should tanks roll in. Moments later I ran into BBC correspondent Kate Adie who was walking toward the square with her camera crew. “What’s going on,” she asked. “Looks like the army is making a move tonight,” I answered. I explained that I hadn’t seen any troops or tanks in the square at that point, but I did see muzzle flashes from the roof of the Great Hall of the People on the west side of the square. A day before several hundred troops had massed behind the Great Hall and I assumed they had been positioned on the roof. I rode my bicycle north toward Chang’an Avenue and hadn’t gotten very far when I noticed a line of Armored Personnel Carriers moving toward the square flanked by hundreds of soldiers with fixed bayonets. Seconds later the dark sky was interlaced by red and yellow tracer fire, and I could hear bullets ricocheting off of concrete. I turned my bike around and raced back toward the south end of the square. Like a lot of my fellow correspondents, I never thought the government would use deadly force against the students. As the firing intensified thousands of more residents poured out of their houses and formed human blockades where streets entered the square. They quickly became targets for the machine gun and small arms fire. As the casualties mounted, the crowds became increasingly belligerent. They armed themselves with bricks, bottles, iron rods and wooden clubs and attacked some of the military contingents, including tanks. 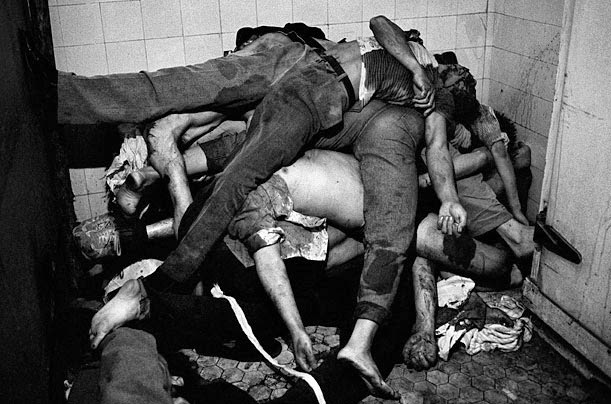 An infuriated mob grabbed one soldier and set him afire after dousing him with gasoline. They then hung his still smoldering body from a pedestrian overpass. It was one of the many examples of instant justice meted out that night. The crowd accused the soldier of having shot an old woman to death. I watched the wounded and the dead being carted from the square and the area surrounding it on the flatbeds of three-wheeled vehicles. The stinging stench of tear gas hovered over the embattled city and burned my eyes. Around 2 a.m. at the height of the armed assault, a maverick tank careened down Jianguomenwai Avenue in an attempt to crack open the way for troop convoys unable to pass through the milling crowds. With its turret closed, the tank was bombarded with stones and bottles as it sped down the avenue. Young cyclists headed it off, then slowed to bring it to a halt. But the tank raced on, the cyclists deftly avoiding its clattering treads by mere inches. On the Jianguomenwai bridge over the city’s main ring road, where a 25-truck convoy had been marooned for hours by a mass of angry civilians clambering all over it, a tank raced through the crowd. It sideswiped one of the army trucks, and a young soldier who was clinging to its side was flung off and killed instantly. The worst fighting of the night occurred around the Minzu Hotel, west of the square, where grim-faced troops opened fire with tracer rounds on milling crowds blocking their access to the square. Bullets ripped into the crowd and scores of people were wounded. The dead and wounded were thrown on the side of the road among a pile of abandoned bicycles as the troops moved on to take the square. One tank ran into the back of another that had stalled on Chang’an Avenue. As they hurriedly bounced apart, the machine guns on their turrets began to train on an approaching crowd of about 10,000. The machine guns erupted, sending tracers above the heads of the crowd. Men and women scurried for cover, many crawling into the piles of dead and wounded along the side of the road. In my haste to return to the square, I had forgotten to bring my camera. Even though it was night, the square was illuminated by street lamps and the sky above it was lit almost continuously with tracers and bright flares. I decided not to ride my bicycle to avoid becoming a larger target. At the same time, I didn’t want to lose the only form of transportation I had, so I pushed it wherever I went, sometimes crouching behind it. Finally, I found a small tree and padlocked it to the trunk. For most of the night, I found myself caught between trying to cover the tragedy unfolding in and around the square and watching my back. I didn’t want to be caught in the sites of some trigger happy soldier. At one point several hundred troops successfully occupied a corner of the square and I watched as a crowd of some 3,000 howling unarmed students surged toward them on foot and by bicycle, intent on breaking through their line with their bare hands. A few in front of the main body rammed their bikes into the troops and were quickly beaten to the ground by soldiers using the butts of their rifles or clubs. “Fascists! Murderers!” the crowd chanted. As the main body of the crowd got within 50 yards of the first line of troops, an army commander blew a whistle, and the soldiers turned and fired volleys of automatic rifle fire. Screams of pain followed. The protesters threw themselves and their bikes on the pavement of the Avenue of Eternal Peace. Dragging their bikes behind them, they crawled to safety, pursued by rifle fire and the throaty war cries of the soldiers. When the firing momentarily stopped, the crowd regrouped and slowly crept back toward the square. Then the volleys rang out again, more intense this time. Two lines of soldiers began to chase the mob, alternately firing tear gas and bullets. I watched several people stagger and fall to the ground. The acrid smell of tear gas triggered a paroxysm of coughing in the crowd. People ripped off shirt sleeves and used them as handkerchiefs over their mouths. The bodies of three women were laid out on the pavement of a side street to await transport. A crowd gathered around them, waving fists and cursing the government. “How many people did you kill?” they shouted at steel-helmeted soldiers who stood stonily with AK-47 assault rifles cradled across their chests. The fighting continued throughout the night as exhausted students and other dissidents engaged in hit and run battles with soldiers, tanks, and APC’s. Some students, many of them wounded, scrambled aboard abandoned buses seeking refuge and aid. I watched soldiers pull them out and beat them with heavy clubs. Several of the students, bleeding from head wounds, ran toward where I had taken cover behind a low stone wall. One of the students, a girl of maybe 16, had been shot through the shoulder and was bleeding profusely. She was falling in and out of consciousness and looked to be in shock. I looked behind me to see if there was some way to get her assistance. In the distance, I saw a man waving at me from a doorway of a brick wall. He was motioning me to bring the girl and other wounded students to him, all the while carefully watching for soldiers. I pulled her up and with the help of another reporter, dashed with her and several other wounded students to the gate. The man quickly wrapped a blanket around the girl and took her inside the compound with the other students. I jogged back to the low wall where I had been kneeling before. I recall thinking that if I were wounded at least, I now knew where I could go for help. For the next few hours, I moved from one location to another, trying to find a spot where I could see what was happening while making sure I had an escape route should I come under fire. The square was finally cleared at dawn when four personnel carriers raced across it, flattening not only the tents of the demonstrators but the “Goddess of Liberty” statue. I looked at my watch. It was about 5:30 and dawn was breaking over the city. Ten minutes later a negotiated settlement allowed the hard-core remnants of the democracy movement—some 5,000 students and their supporters—to leave by the southeastern corner of the square. As they left singing the Internationale, troops ritually beat them with wooden clubs and metal rods. The army had been ordered to clear the Square by 6 a.m, and it had done so but at a terrible cost. As daylight broke over the Avenue of Eternal Peace dazed knots of Chinese, many of them weeping and all of them angry at their government, stood at intersections, reliving the events of a few hours before when tracer bullets and flares turned the black Beijing sky into a deadly torrent of crimson. Along the roadside leading into the square lay several wounded, some perhaps already dead. I walked back to where I had left my bicycle and rode to the Jianguo Hotel. As I peddled along mostly deserted streets, I tried to make sense out of what I had seen. With the students already dispersing from the square or planning to, the attack by the army was unnecessarily brutal. There was little doubt that what I had witnessed was an assault designed to punish the demonstrators for embarrassing China’s leadership—Premiere Li Peng and Deng Xiaoping, the ailing leader of China’s Communist Party. China’s leaders have not forgotten the pro-democracy demonstrations of 1989. Unnerved by turbulence among Tibetans and always nervous about the possibility of human rights protests in the heart of the capital, China barred live television coverage from Tiananmen Square during the 2008 Beijing Olympics—just as it had in 1989. It will probably do the same on the 29th anniversary of the slaughter. However, it remains to be seen whether or not such a ban will exorcise the ghosts of June 4, 1989, that still hang over Tiananmen Square. 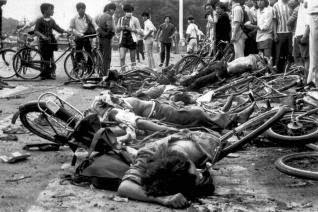 There is little doubt that time has not healed the deep wounds inflicted on China’s people that terrible night 29 years ago. CLICK HERE FOR MY INTERVIEW WITH NATIONAL PUBLIC RADIO ON THE 25TH ANNIVERSARY OF THE MASSACRE. (Note: there are two links that will take you to the NPR site. The top link on the NPR site is a shorter edited interview and the bottom link is an extended interview.